Anyone Remember the Smart Mop Infomercial hosted by Suzie Brandon? My all time fave bad infomercial was the glorious new yorker Suzie Brandon and the crappy Smartmop. For some inexplicable reason she had a blond Swedish gigolo demonstrating it for her. It contains the single best audience overacting ever seen on tv when that crazy Swede holds a smartmop full of crap over their heads. Wonderful! Yet nobody I know seems to remember it. PLEASE guys, can you help out?? Unfortunately, the only version of the Smart Mop infomercial I have ever seen is the one in which Anthony “Sully” Sullivan wrings the mop into a drinking glass. Too bad, because that thing sounds hilarious. 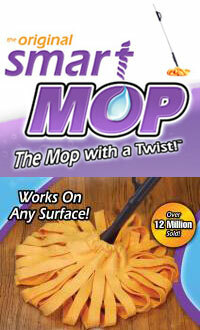 As for Suzie Brandon and the original smart mop infomercial? Well, I am stunned that you have never seen this. It was, quite simply, the stupidest, most ludicrously oversold product ever. The audience reactions alone make this an all time classic. Apart from the fabulous miss Suzie herself, a classic, brassy, new yorker with a mouth like the Lincoln tunnel and teeth that make the Osmonds look like amateurs, there’s also an utterly weird choice of ‘expert’, Tomas from Sweden. Begging the question, “why Sweden?? ?” as he’s a blond hunk with a fake scandinavian accent one assumes that either he was sleeping with a producer, Suzie herself (unlikely) or it was simply to titivate the thick women who make up 80% of the ‘audience’. Somewhere I have an old VCR recording of most of it, but sadly I doubt I will ever be able to find it except by happy accident. I’m sure someone, somewhere must have the whole thing uploaded? I do hope so! Please let me know if you manage to find it meantime!! If anyone out there has a copy of this version of the Smart Mop infomercial, please send me a message through the contact page. If anyone else remembers Suzie Brandon and her Swedish stud trying to pitch the Smart Mop, please leave a comment below. Actually, Santo Gold himself is the only one who claims to have a copy of Blood Circus (http://santogold.com/). I was thinking maybe this version came out in the mid 90s around 1994 or 1995. Re reply no 4 above – It’s quite possible that this version did come out as early as that in the USA. However I doubt it was around for us to marvel at here in the UK at that time as we didn’t have the shopping channels back then. Nice to read that someone else remembers it though! Thank you so much for the link, Paul! Glad I finally got a chance to see it. I’ve also sent Gary an email with the link. Fantastic! Thanks guys. I knew somebody out there would find this classic. As Suzie herself would screech “ewwwwwwww”! Yeees, in Germany Suzie Brandon became absolute cult for this horrible commercial. Here’s a moment from the dubbed version + a parody. Actually, the Swedish guy Thomas in the infomercial started selling the Smart Mop on fairs. No one would lend hon money to do an infomercial, But eventually he could pay for this one himself. They sold millons, and after that, different version of twist mops have sold probably at least 70 million units in the US, from Rubbermaid, O’cedar etc etc. I just found back a tape from 1995 with the entire show on it (very badly and therefore hysterically) dubbed in Dutch.It’s so screamingly funny. I was al big fan of the WIS teleshopping programmes back then (I was 10) and had a blast yesterday when I saw it back.